I never imagined that I'd be making soup from nuts -- I always thought of nuts as an additive, a very nice additive, but not the main part of anything, except for snacking. (And maybe my favorite pistachio ice cream.) But I've learned that chestnut soup is a very traditional fall soup, and a staple at many a Thanksgiving table. It's a great soup. It's rich, smooth and creamy, without cream. It gets its richness straight from the sweet chestnuts, which, I also learned is low in calories and has all kinds of other good things going for them, like they're the only nut that has Vitamin C. And they're gluten-free. The only bad thing I can say about this recipe is that roasting and peeling the nuts is a bit of a chore. But it's worth the effort and certainly can be done ahead of time. We're lucky to have a neighbor who gave us a couple chestnut tree saplings that finally bore fruit last year. This was not a good year for our own trees but our neighbor still shared some of his. The original recipe called for bottled chestnuts, which I've never even looked for in a store. 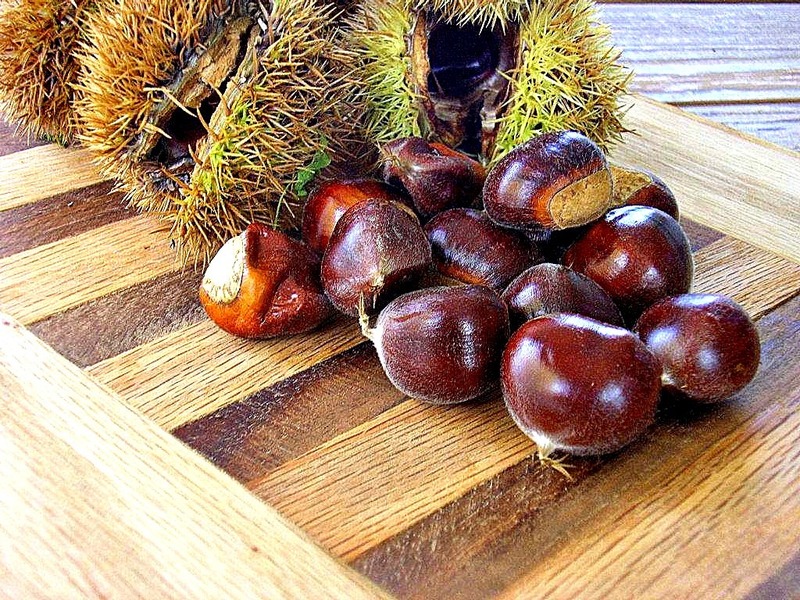 But at this time of year, chestnuts show up in many produce departments. I first posted this recipe about a year ago when I guest posted at Eat Yourself Skinny. And I realized I never posted it here. So here you go . . . . Prepare the puree. Combine onion, carrot and oil on same jelly-roll pain. Toss to coat the vegetables. Bake for 1/2 hour or until tender, stirring occasionally. Add the chestnuts in bowl and stir in broth. Pour half the mixture into a blender and blend until smooth. Pour the pureed mixture into a large pot. Repeat procedure with remaining broth mixture. Or, if you're lucky enough to have an immersion blender, put everything into the large pot and puree it all at once in the pot. Stir in the 1/2 teaspoon salt and pepper. Place pot over medium high heat and bring to a simmer, then reduce heat and simmer 20 minutes. Add the sherry, if you like. Prepare the whipped cream. Place cream in medium bowl and beat with a hand mixer at high speed until soft peaks form. Add remaining 1/8 teaspoon salt and beat at high speed until stiff peaks form. Serve. Ladle soup into bowls and top serving with about a teaspoon of whipped cream. Sprinkle with thyme and serve. I was surprised at how much I enjoyed it. So rich and elegant -- but it's not fattening! Tastes even better than pumpkin or squash soup. I loved it. Yum! I've never cooked with chestnuts, much less made soup! This sounds wonderful,looks like we're both in the soup mood today! Yes, I'm a soup girl, too, and your arugula-spinach soup is right up my alley! I adore nuts...and this recipe looks awesome. Nuts become so deliciously creamy when cooked and pureed. The first time I made this, I was surprised just how creamy the soup became, with no cream! I've always wanted to try a chestnut soup, Rosemary, so thanks for that. They are not very common trees in Ireland (although the inedible horse chestnut is one of my favourite autumn trees) but I will look out for them as I am dying to try this recipe. This is the soup and chestnut season! Looks really creamy and irresistible! Angie, I just love that the creaminess comes from the nuts, not cream! I love Roasted Chestnuts... can't wait to try this soup. It looks amazing! Now that I've tried this soup a few times (and I already knew I liked roasted chestnuts) I think I'll have to try chestnut stuffing. What a pretty soup Rosemary. I've never made a soup from nuts either, although I know the phrase from soup to nuts :) Thank you for the inspiration. This soup would make a wonderful sophisticated first course for Thanksgiving dinner. Thanks, Sam. You know if we ever get to the point where we have a smaller Thanksgiving dinner, where everyone's not expecting their two potatoes, stuffing, gravy, desserts and more desserts, I'm putting this on the menu! It's kinda like squash or pumpkin or sweet potato or pumpkin . . . but different! ANd good! I'm thinking I should find some jarred chestnuts and have them ready in the pantry, too, Lizzy. Rosemary, we brought back a lot of chestnuts from Italy, already out of their fuzzy shells and ready to roast. I'll share this recipe with my mother and will try to make this for the holidays! It sounds perfectly heavenly! Thank you for sharing your recipe and photos! Wow! Imported chestnuts! I do hope you make this soup, Roz. I'd love to hear how you and your family like it! so warm and comforting and packed with fall flavor, yum! Maybe we're both just nuts! Yeppir, that thyme cream added just the right touch. I never tried a nut soup before either. And it is a lot like carrot soup; just richer. Ilove to try new things; this one was a definite success! I have eaten chestnuts but never had them in a soup...I'm sure it was delicious. It was good;you should give it a try! I tried it with the vacuum packed "cooked and peeled" chestnuts from the grocery store. I found it too watery and grainy. Next time I will try the raw uncooked nuts and see if I get a better result. Thank you for this wonderful idea! we will make it a new tradition for Thanksgiving! Since I've only made the soup with roasted chestnuts, I don't know how uncooked nuts would be. But they're a rather soft nut to start with, so it just might work!